Makapuu: Wave heights 2-4 feet over the next day or two. Sunset Beach: Wave heights 4-8 feet over the next day or two. 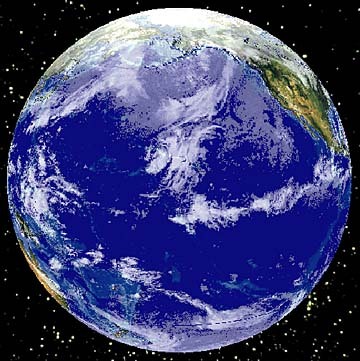 Coastal waters: Winds south-southeast at 8-16 knots through tomorrow. Waves 3-4 feet. Channels: Winds south-southeast at 10-20 knots through tomorrow. Waves 3-5 feet. Big Island: Hilo - A couple showers tonight. Low 72. Tomorrow, partly sunny. High 80. Kona - Showers tonight. Low 70. Tomorrow, partly sunny. High 82. 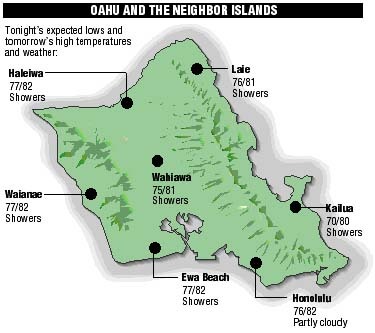 Maui: Showers tonight. Low 68-74. Tomorrow, partly sunny. High 76-84. Kauai: Showers and t-storms through tomorrow. Low tonight 68-74. High tomorrow 76-82. Eruption of Kilauea continues. Lava is flowing in a remote area of the park sluggishly to the sea. Sunset tonight -- 6:03 p.m.
Sunrise tomorrow -- 6:30 a.m.
Moonset tonight -- 3:22 a.m.
Moonrise tomorrow -- 4:56 p.m.
Fri.	2:24a.m. 1.7 ft.	8:18a.m. 0.4 ft.
2:17p.m. 1.8 ft.	8:37p.m. 0.0 ft. Sat. 3:02a.m. 1.9 ft.	9:09a.m. 0.3 ft.
2:56p.m. 1.7 ft.	9:07p.m. 0.0 ft.
Sun. 3:43a.m. 2.1 ft.	10:02a.m. 0.3 ft.
3:36p.m. 1.5 ft.	9:38p.m. -0.1 ft.